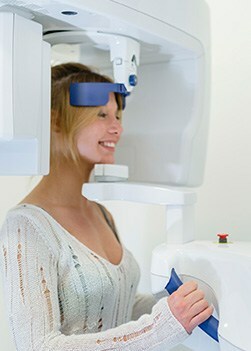 3D Cone Beam Imaging | Brooks Dental, P.C. Over the past five years, cone beam imaging has revolutionized dentistry, forever changing the way oral health professionals assess and evaluate the jaw, teeth, and skull. This type of digital imaging is of particular use in the planning and placement of dental implants, orthodontic treatment, orthognathic TMJ analysis, and more. Unlike traditional digital X-ray imaging, cone beam volumetric tomography captures hundreds of “slices” of digital information that are then converted by specialized software into a clear, precise 3D image. To learn more about how digital radiography and cone beam imaging benefit you, simply ask one of our skilled technicians. 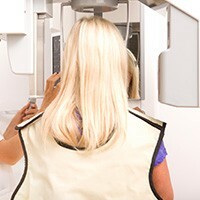 Why Choose Brooks Dental for 3D Cone-Beam Imaging? Brooks Dental is always on the lookout for the latest in dental technology, so that we can give our patients superior care. With this in mind, our practice uses the new Carestream 9300 System for 3D cone beam imaging. Combining panoramic imaging, cone beam CT (CBCT) technology and cephalometric (head measuring) capabilities, the CS 9300 creates virtually limitless views of the face, neck, sinuses, and teeth, which are invaluable when planning the dental implant placement, orthodontic treatment, endodontic treatment (root canals) orthognathic TMJ analysis, and more. The Carestream 9300 System is essentially a digital scanner that is mounted on a rotating arm. Using cone beam imaging technology, the scanner projects x-rays in a carefully controlled, cone-shaped beam. Patients simply sit or stand in place while the scanner moves in one complete circle around the head, gathering volumes of scan data. From that scan, our dentists can quickly visualize computer-generated, 3-dimensional views of the facial bones, teeth, and other facial structures from multiple angles, in three dimensions and in color. Now, we can see the relationships between bones, teeth, your airway, nerves and tissue, and thus be better able to diagnose and evaluate treatment options. 3D cone beam imaging produces the same kind of high-quality images as a CAT scan, but it does so with less radiation. And not only does this technology provide a more thorough study of your case from every angle, but the original scan data can be quickly duplicated, so we can easily forward information to different specialists if necessary. Finally, the data is stored on a computer, so there’s no film that could get lost. For Brooks Dental, the Carestream 9300 System’s complete information is a vital component of the quality care we provide. As a patient, you will have greater confidence in our evaluation of your case and higher satisfaction from your treatment. At Brooks Dental, we’re committed to providing you with dental solutions that create both optimal health and beautiful smiles. Contact our Winthrop, MA dental office today to schedule an appointment.